Members of the Garden Club of Bermuda cleaned up part of the race route before the start of the Bermuda Marathon Weekend, and in addition, the Garden Club made a donation of $5,000 to Keep Bermuda Beautiful. 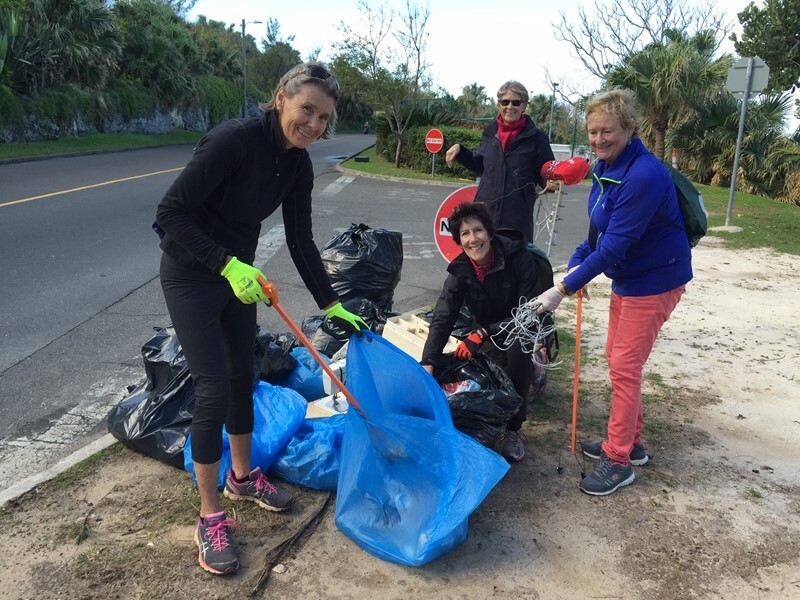 For several years, Garden Club members have donned their gardening gloves and come out to do a KBB litter cleanup in advance of the Bermuda Marathon Weekend. This year the cleanup area was along Palmetto Road from North Shore to Dock Hill which is part of the route to the finish at the National Sports Centre. 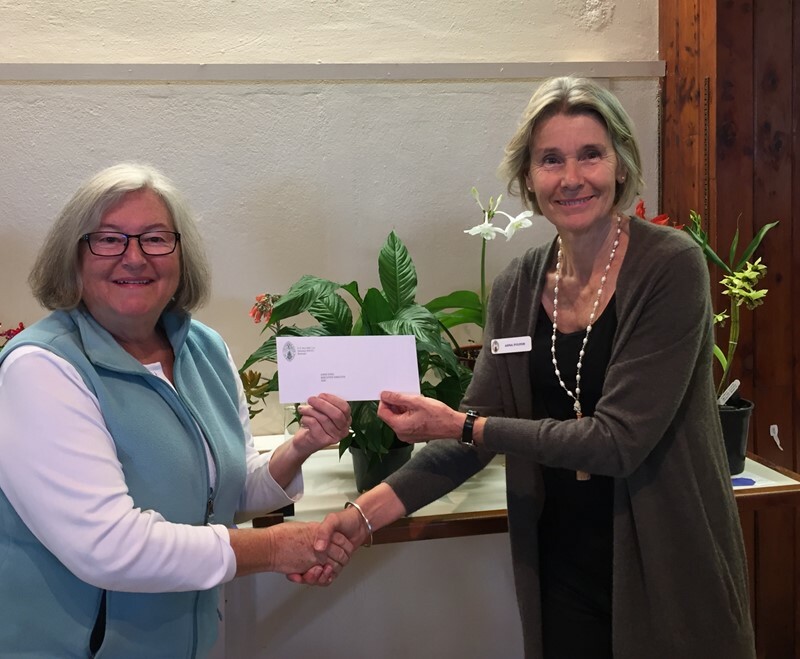 At Friday’s meeting, Garden Club President, Anna Fulton presented KBB with a cheque to sponsor KBB’s Executive Director, Anne Hyde, during the month of June to be involved with America’s Cup sustainability. Mrs. Fulton said, “The Garden Club is pleased to make a donation to KBB in support of KBB’s endeavor to work alongside the America’s Cup event this summer. “Our $5,000 donation will assist KBB Executive Director, Anne Hyde, in ensuring that there is training for the Sustainability Volunteers in First Mates programme in partnership with ACBDA & ACEA. “Our Club has shared a longtime relationship with KBB which it considers part of its offspring. This partnership includes Garden Club man-hours usually given for a specific cleanup event. In 1962, the Garden Club formed the Keep Bermuda Beautiful Committee. Two years later the Committee decided there was enough need to set up as a separate charity. The two environmental organizations maintain a close bond. A Garden Club representative sits on the Board of Directors for KBB. “I am very happy to receive this sponsorship so that I can devote time during the America’s Cup to assisting with training First Mate volunteers on the environmental sustainability measures that the Event Authority are putting into place,” said Anne Hyde, who runs the day to day operations of Keep Bermuda Beautiful. Thank you for all your efforts! Keep Bermuda Beautiful! Thank you KBB and The Garden Club for taking action to show Bermuda at our best for our local runners and our guests this weekend. KBB is worthy of all our support- Ms. Anne Hyde and the KBB organisation is a gift to our island – ever reminding us that with a little more effort we can reduce the impact of humans on nature. How she does everything she does? Connecting so many Bermudians and residents with caring for our island is very impressive. She has found a way to host our island diversity and link us together with caring for the beauty of our island home. May you all continue in your good work as we continue to host ourselves and the world within the beauty of our island and our people.